I heard an NPR call-in show this weekend about the new Amazon Kindle, and the callers seemed to fall into two categories: they liked it because it was new and did things books don't, or they didn't like it because it wasn't a book. However, there was one point that the callers and host never seemed to make: books, magazines, newspapers, Kindles, skywriting, paintings, etc. are all just different ways to convey information. The difference with the Kindle is that the information never needs to change formats as it moves through the supply chain. The author can type a manuscript on a laptop, email it to an editor, the editor forwards it to the publisher, the publisher creates properly formatted final copies, which the reader downloads and reads. It can all happen without the information ever being manifest in the physical world. This reminded me of how most money works now - paychecks can direct-deposited into a bank account, purchases made with a credit card, and credit card payments can be automatically withdrawn from the bank account. It feels like we don't even need to be involved, as everything is electronic and automatic. I would say that all of my "wealth" is just on paper, but it's not even on paper - it's just stored in memory. So I could be a rich as Scrooge McDuck, but it seems the days of swimming in cash are over. Which seems to be part of peoples' reluctance to the Kindle - there's nothing tangible about an ebook, so it doesn't feel real. Newspapers and magazines seem to fit well with the Kindle, because they are inherently temporary, but books have more of a permanence that ebooks just haven't recreated yet. They need to convince me that an ebook copy is going to last longer than the quick life cycle of these devices. 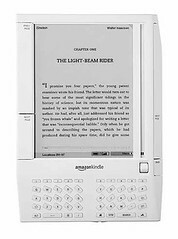 I know a lot has already been said about the Kindle, Amazon's new book reader. I more or less gave it all a miss, because I am kind of a Luddite when it comes to techno-toys. Go figure. But a friend of mine forwarded me an article from this week's Entertainment Weekly, in which Stephen King reviews the Kindle. This caught my attention because King has long been out front exploring and playing in the post-print/electronic book world. [It's] a gadget with stories hiding inside it. What's wrong with that? His point is that, although a physical book does have its own intrinsic value, it's the text, the story or the information, that's the most important thing. I agree. He says that in the case of the Kindle, once you get used to the device, you forget about it and let the story encompass your attention. He wasn't "using a Kindle," he was reading a story. And that's what's important. Another recent development in the "it's the information, not the package" department is Phonepedia. Casey mashed up a voice-recognition front-end with Wikipedia. People call a phone number, ask a question, and the Wikipedia article answering that question is then texted/emailed to them. Information Without Borders in action. But back to the Kindle: from what I gather (from outside the article now), the biggest drawback seems to be that Kindle-compatible books can only be purchased from Amazon, and only used on the Kindle. Their Whispernet apparently makes it very easy to do, but when you're locked into a technology like that, it essentially is building in a short lifespan. Just ask anyone who bought a laser disc. From a consumer point of view, it seems like a neat product. But from a library point of view, it just doesn't seem applicable. The adjustable font size is great, as are automatic subscriptions to newspapers and magazines. But for for circulating books to patrons, it just doesn't seem to fit. 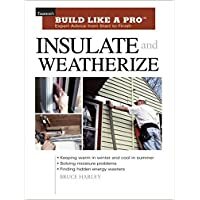 In preparation for this colder weather, my library had a book display about home insulation, heating efficiency, and weatherizing. This prompted me to purchase a few new books, but I found something I never expected. When looking for books similar to what the library already has, one of the tools I use is Amazon.com. That might be library blasphemy, but between Amazon's various suggestion services, its subject categories, and a greasemonkey script for directly checking our catalog, it's a quick and dirty way to find what I'm looking for. As you might think, it's certainly not 100% reliable. But this time, I happened across one book with subjects that puts even "cookery" to shame. "Cloning?" "Babysitters?" "Juvenile fiction?" And my favorite, "Life on other planets?" I know Amazon's sole function is to push as much stuff as possible at visitors to maximize sales, but come on. At least it was good for a laugh. This has already been mentioned, but Amazon.com is launching a service for answering reference questions, and calling it "Askville." Askville is a community based website where users can easily ask and answer questions, share their knowledge and meet others with similar interests. Additionally, you can earn experience points in various topics and Quest coins, Askville's virtual currency. Eventually, you will be able to your Quest coins on an upcoming site called Questville.com scheduled to launch in 2007. As the LibrarianInBlack pointed out, Askville is incorporating social networking to answer questions - and from the few questions I posed to the service, the answers were of good quality and with quick turnaround. Having average lay netziens answering questions (rather than degreed librarians) means answers must still be considered within the context of the source, but the social critical mass approach has worked well for Wikipedia. What I'm not sure about is the whole Questville.com coins thing. Askville allows you to earn coins by asking and answering questions, and also by rating given answers. I presume coins will be cashed in to buy stuff. Perhaps this is the component that Google Answers was missing - if Amazon can figure out a good business model for social reference, then I'm sure Google Answers will find a way back into the market, too. In the meantime, there's always your local library and places like the Internet Public Library that still do this without gimmicky profit schemes. For more on Askville, check their blog.